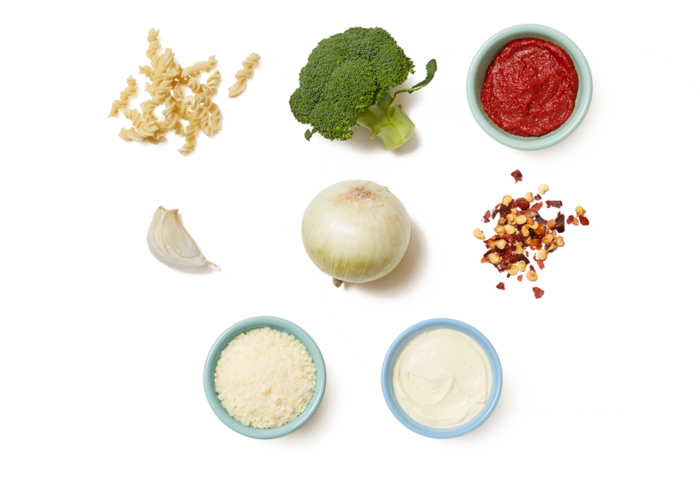 Fresh Fusilli & Broccoli Fill 1 Created with Sketch. 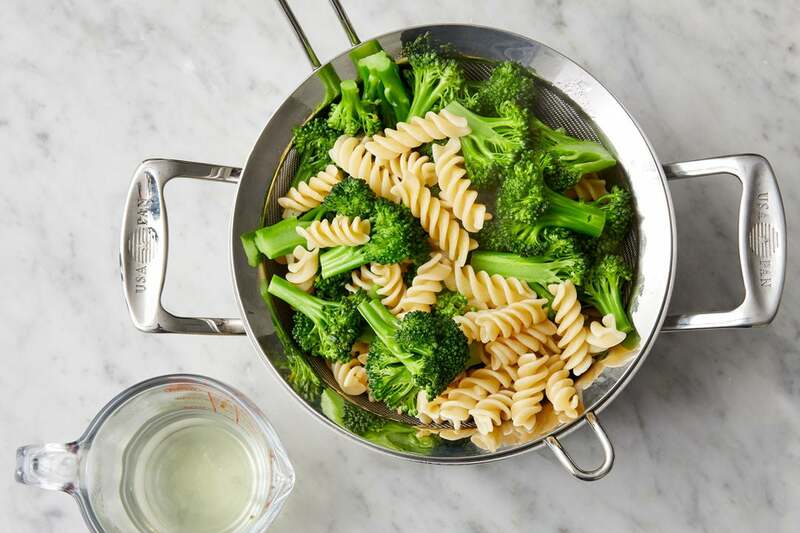 Springy fresh fusilli is the star of tonight’s quick-cooking dish. 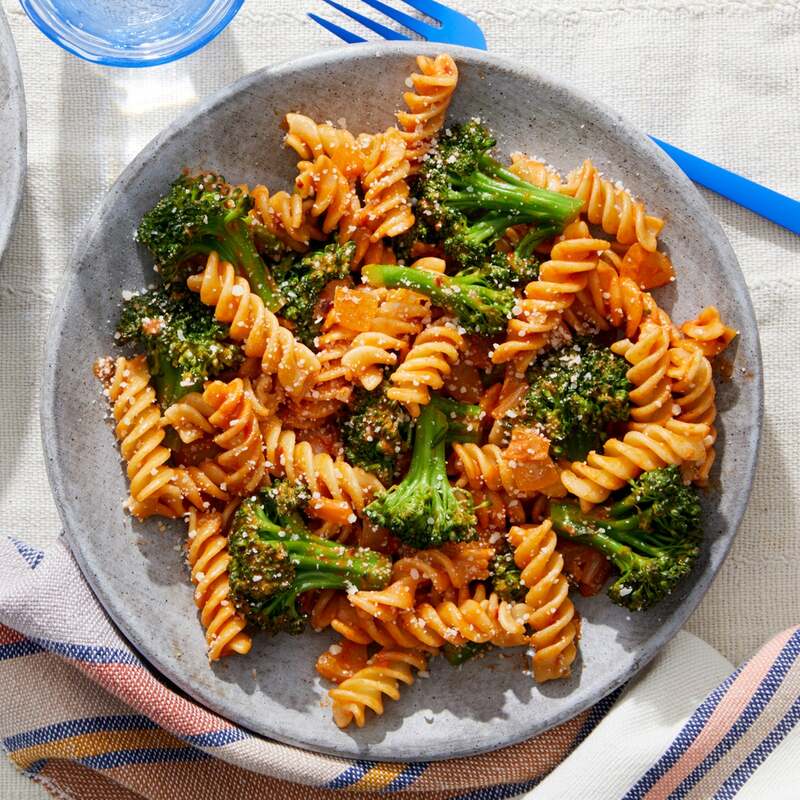 To make things even easier, we’re cooking the pasta and broccoli together before folding them into our lightly creamy tomato sauce. It’s all complete with a sprinkle of pecorino cheese. Heat a medium pot of salted water to boiling on high. Wash and dry the fresh produce. Peel and medium dice the onion. Peel and roughly chop the garlic. Cut off and discard the bottom 1/2 inch of the broccoli stem; cut the broccoli into small florets. In a large pan (nonstick, if you have one), heat 1 tablespoon of olive oil on medium-high until hot. 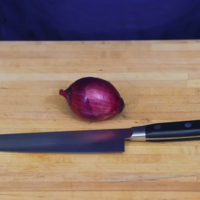 Add the diced onion; season with salt and pepper. 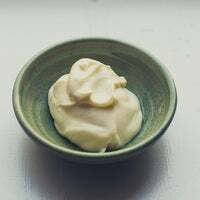 Cook, stirring frequently, 3 to 4 minutes, or until slightly softened. 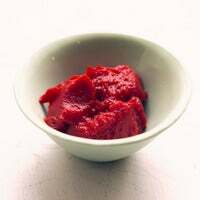 Add the chopped garlic, tomato paste, and as much of the red pepper flakes as you’d like, depending on how spicy you’d like the dish to be. Season with salt and pepper. Cook, stirring constantly, 1 to 2 minutes, or until thoroughly combined. Add 1/2 cup of water (carefully, as the liquid may splatter); season with salt and pepper. Cook, stirring occasionally, 1 to 2 minutes, or until thickened. Turn off the heat. Season with salt and pepper to taste. 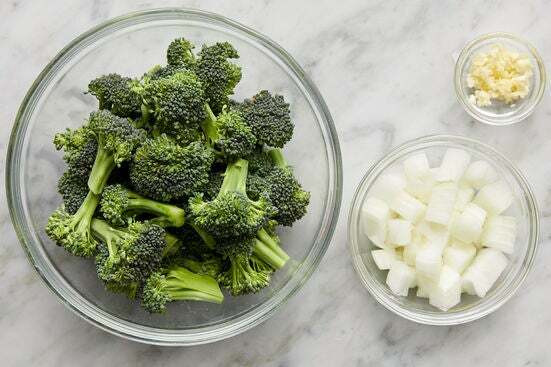 While the sauce cooks, add the broccoli florets to the pot of boiling water; cook 2 minutes, or until bright green. Add the pasta and continue to cook 2 to 3 minutes, or until the broccoli is tender when pierced with a fork and the pasta is al dente (still slightly firm to the bite). Reserving 1/2 cup of the cooking water, drain thoroughly. 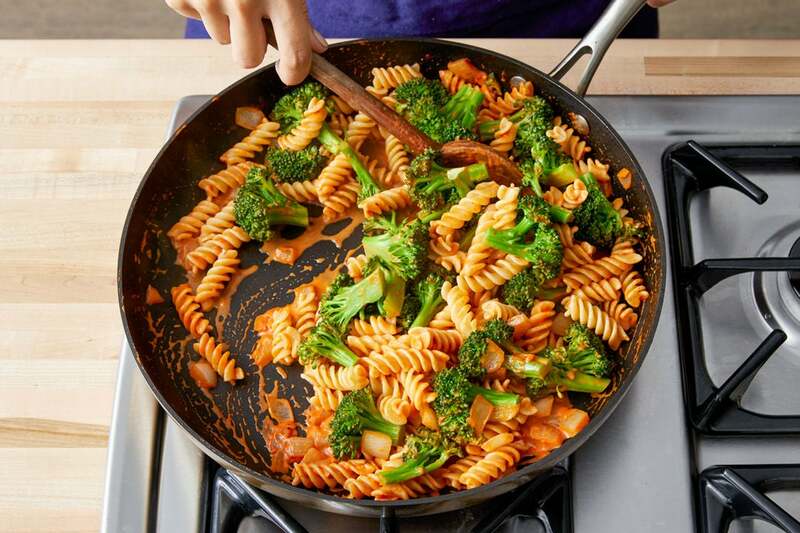 To the pan of sauce, add the cooked broccoli and pasta, mascarpone cheese, and half the reserved cooking water. 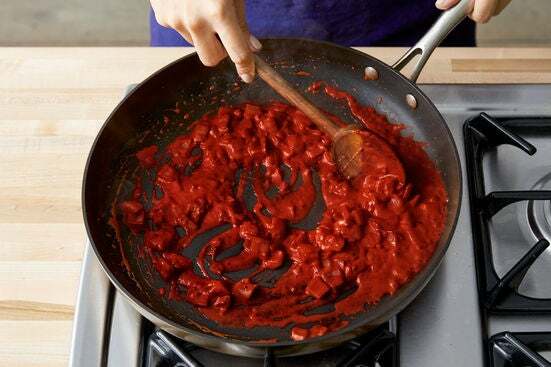 Cook on medium-high, stirring vigorously, 1 to 2 minutes, or until the pasta is coated. 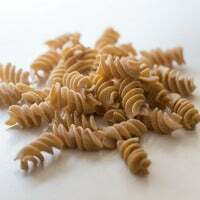 If the pasta seems dry, gradually add the remaining cooking water to achieve your desired consistency. Turn off the heat and season with salt and pepper to taste. 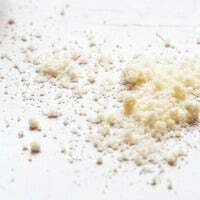 Serve the finished pasta garnished with the pecorino cheese. Enjoy!